Clinicians are searching for new methods to both better detect smaller lesions and quickly ascertain whether a patient is responding to current treatments. Let's face it: the better the image quality, the greater role it can play in helping to detect cancer. Therefore, it's no wonder that scanner manufacturers have put their best people to work to expand their PET/CT offerings and discover new tools and equipment that are more beneficial to both doctors and patients. Jim McCann, senior product manager for Toshiba's CT business unit, notes the biggest buzz of the moment is that the industry is trending toward faster, more efficient scanners for the PET side of PET/CT. "Toshiba's Celesteion offers fast and efficient PET scans through detector optimization and crystal efficiency, with better utilization of crystals' efficiency and light output," he says. "Better crystal utilization and detector efficiency make the scan shorter and help improve patient satisfaction." McCann says there's been an increase in customers looking for digital PET, and Toshiba is working on developing such a system. "Digital PET is the first major enhancement to PET since time of flight in 2007. The PET market will most likely stay flat until delivery of digital PET is offered by by more than one vendor," he says. "I think in the next five to 10 years you'll see more changes on the CT side of PET/CT, although it's difficult to say what will come after digital PET." In 2014, Philips Healthcare introduced Vereos PET/CT, the first digital PET/CT scanner, which uses digital silicon photomultiplier detectors instead of traditional analog detectors. The new scanner improves performance by doubling sensitivity gain, volumetric resolution, and quantitative accuracy. "From connected devices to data-driven insights, the pace of imaging innovation is allowing us to see more," says Gene Saragnese, Philips' imaging systems CEO. "Molecular imaging technology is leading the way with digital detection and advanced visualization built on insights from those at the heart of care." A recent survey Philips conducted found nine out of 10 referring physicians prefer Vereos Digital PET images to analog. Bich Le, general manager of PET/CT for General Electric (GE) Healthcare, notes the company's latest offering is its Discovery IQ PET/CT system, which enables both outstanding image quality and intelligent quantitation. "Physicians not only want the ability to detect smaller lesions but also want the ability to determine whether a patient is responding to current treatment," she says. "Our system can image with both half the PET dose and half the scan time. We've had really nice feedback from physicians who cite the ability to detect smaller lesions from using the tool." Discovery IQ delivers the highest National Electrical Manufacturers Association sensitivity (up to 22 cps/kBq) and the largest axial field-of-view (up to 26 cm) compared with other market-leading PET/CT equipment, according to GE Healthcare. GE Healthcare's Q.Clear technology is a critical component of Discovery IQ, as it delivers no trade-off between image quality and quantitative standardized uptake value measurements. Le notes that it provides twice the improvement in both quantitative accuracy and image quality in PET/CT imaging, helping physicians across the cancer care continuum from diagnosis and staging to treatment planning and assessment. Another trend in PET/CT imaging is that quantitation, and its application to cancer treatment in particular, is an increasingly important focus. Accurate quantitation needs a consistent measurement to monitor cancer treatment over time to determine whether treatment is working. Robert Brait, Siemens' molecular imaging product manager, notes there are a couple of trends resonating with the company's PET/CT customer base in 2015. "One of the most obvious is cost-conscious type purchases, where the systems they are looking at more often than not are at the lower end of the spectrum, with 16- to 20-slice PET/CT scanners being the scanners of choice," he says. "There's also a focus on quantification now more than ever before." 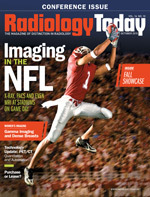 The company's Biograph mCT Flow eliminates the need for "stop-and-go" imaging. Planning and scanning are based on a single continuous motion of the patient table, designed to provide better images for diagnosing disease and evaluating treatments. "The image illustrates a lesion and that's the picture of the disease, but it's also important to quantify how active that lesion is. The idea is, if you can quantify the lesion, you can begin to assess its ability and you're able to determine the effectiveness of treatment once a patient has started either chemo or radiation therapy," Brait says. Brait adds that workflow "from the technologist to the radiologist" that's both efficient and consistent is an important component of PET/CT development. Brait says most PET/CT manufacturers are working to better automate the scanning process, so there is more consistent, reliable data and less variation in results between one individual and another performing the same exam. "Siemens takes great pride in trying to develop features on our systems to meet these needs," Brait says. "Our mCT suite features functionality that helps support the oncology market, illustrating in a way the oncologist would like to see it and quantified accordingly." For example, its software provides metal artifact correcting, which helps in cases such as when patients have a metal implant in their hip and a lesion in their pelvis. A hip replacement often includes an artifact that masks the lesion, but the equipment allows the tissue to be seen more clearly. Siemens' EQ-PET allows users to harmonize different data types received from different scanners on the same patients. For example, if someone is seeing a patient who goes from one facility using a competitor's scanner to a second facility using a Siemens scanner, the scan quantification values often differ. The EQ-PET system works to adjust that to help radiologists better understand the data. According to Le, there are a number of challenges that come into play for accurate quantification. "Motion today is still a big piece of quantitative accuracy, so when you think about how much variability there is, it can be as high as 6%," Le says. "There's natural variability related to just the human metabolism. If you happen to eat a cheeseburger that morning, vs just a glass of water, things change. Outside of that, there's a variability in the instrumentation and how one deals with motion." Le says GE's Q.Clear is designed to provide more accurate quantitation and excellent image quality for imaging small lesions, to aid radiologists in making an efficient, confident diagnosis. "Beyond quantification, some of the things we are looking at is how a clinician interprets the information from the scanner in a really simple way that's tailored to a particular disease," Le adds. "I think that's a really big piece of where we're going next."